George Benedict was born in Germany where his father was a Rabbi. When the Rabbi accepted a call to Sheffield the family emigrated to England. There young Benedict attended school. It was his desire to serve the God of his fathers by becoming a Rabbi. Immediately after his Bar Mitzvah, he applied for admission to the Rabbinical Seminary in London. The Chief Rabbi, Dr. H. Adler, advised him, however, to wait two or three years, but Benedict begged to be admitted as a student though he was so young. Eventually Dr. Adler consented to admit the boy to the Seminary. Benedict was overwhelmed with joy. In his imagination he already saw the fulfillment of his dream of becoming a Rabbi and walking in the footsteps of his fathers. During his years of study in the big city of London, the rabbinical student visited not only many synagogues but also evangelical churches. A sermon on the temptation of Jesus made such an impression on him that he decided to read the New Testament, until then an unknown book to him. In Farrington Street he came across a barrow with books and bought the holy book of the Christians; hiding it under his coat he took it to his room. In his biography he says: "I shall never forget the verse I read when I opened the New Testament. I felt compelled to read it again and again. These are the words: 'These things I have spoken unto you, that in me ye might have peace. In the world ye shall have tribulation; but be of good cheer; I have overcome the world' (John 16:33). I fell on my knees and for a long time meditated on these wonderful words. On the point of going to a gruesome death, Jesus could say: 'I have overcome the world'." Though at the time Benedict had not yet come to a living faith in Jesus – but had only admired and honored the noble character of the Nazarene – he was courageous enough to state his conviction in a written test. The subject he had voluntarily chosen was: "Jesus – a picture of Jewry." He quoted Isaiah 9:2, "The people who walked in darkness have seen a great light." He described the human sublimity of Jesus and emphasized that He was Israel's greatest son. The Principal of the Seminary was startled when he read the essay. Benedict had to appear before the council of lecturers who questioned him on his attitude towards Christianity. They reproached him for having visited churches. The young student declared his opinions frankly and quoted Jewish writing in his support. The lecturers then decided to discuss amongst themselves whether Benedict could remain as a student. It was hard for him to await the decision. He took his Hebrew Bible and read again Isaiah 9:2, "The people who walked in darkness have seen a great light" and then he came to these words in verse 6, "For unto us a child is born, unto us a son is given; and the government shall be upon his shoulder; and his name shall be called Wonderful, Counselor, The mighty God, The everlasting Father, The Prince of Peace". Benedict asked himself: "Of whom did the great prophet Isaiah speak in this verse, 700 years before the birth of Jesus? Did he speak of Jesus? A small minority of our people are still waiting for the Messiah, but the vast majority are not concerned about this matter. One-third of the world recognized Jesus who was born of our nation. What blindness, what folly not to accept Him as our Saviour!" His Hebrew Bible lay open on his bed – and Benedict knelt to thank God for the Messiah Jesus. At a conference in aid of the oppressed Koreans, Benedict was asked to speak in a church in Philadelphia. On the Sunday morning the minister of the church asked the Rabbi to join him in the pulpit. After the church service the congregation commemorated the Lord's death as He has commanded. Benedict had never before been present at a Communion service. 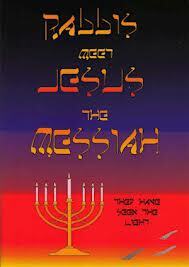 It reminded him of certain Jewish ceremonies such as the Passover. Softly the minister asked him if he would like to partake. For a moment the Rabbi hesitated, thinking: "Is Holy Communion not for Christians only? – and I am a Jew." But when the minister quoted the words of Jesus, "Do this in remembrance of Me." All doubt and hesitation disappeared. Rabbi Benedict took the bread, and later the wine, in remembrance of the death of Jesus who had laid down His life also for the sin of Israel. He thanked the Savior of His love, and unexpected joy filled his soul. Benedict left God's house a new creature. Now he could truly call himself Benedict, i.e. "blessed." The Jewish Rabbi became a minister of the Gospel and many Jews as well as non-Jews were greatly blessed by his testimony and ministry.